I've always liked listening to the radio, my tapes and CDs - did my fair share of taping songs off the radio, rewinding and playing songs over and over again to write down the lyrics (All I wanna do is make love to youuuuu!!!) But I've never been in the band nor have I really tried to learn to play any instrument at all - though I do have lotsa good friends who were in the band, but I dun think that counts. Well, about the closest thing I'd have experience as close as being a musician, is when I'm in the music corner during our Playback Theatre performances. And that was mostly when I was pregnant with Isaac and couldn't be up and about, prancing on stage - so I got to be the musician. Hubbs, now, is a different story. He appreciates music to the extent that he did learn to play quite a few instruments - the guitar, the erhu, the guzheng, the piano... He even took part in a number of school-run talentimes. In the eighties and nineties, he was quite active in the local xinyao scene, frequenting the ming2 ge1 can1 ting1s till the owners recognise him and counts him amongst their friends. Oh, and, when we go to ktv - our friends certainly appreciate his singing better than mine! 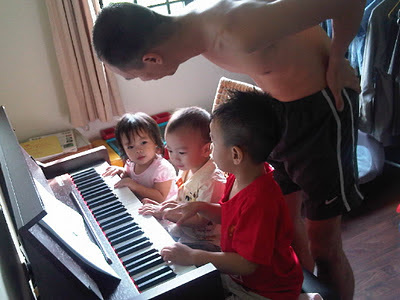 So we've always kinda wondered, if any of our kids would be musically inclined? I was just wondering. But I know hubbs harbours a secret (though pretty apparent, to me at least, it is!) hope that the kidzes turn out more musically inclined than not. Now, Asher and Shawna love listening to songs too. They enjoy the show Hi-5 and would often dance and sing along to the songs. When watching Little Einsteins, they'd both clap and pat along with the characters on the show, and they'd answer questions posed by the Little Einsteins, and by Dora in Dora the Explorer. I found this very interesting because when Isaac was at that age, or even up to a year older than the twins are now, he didn't use to pat along, sing along nor dance along. So I thought it was rather interesting to see the twins do it now. In fact, it's only because Isaac sees them doing it now, that he follows them and does so as well. In the car, the kidzes have already started fighting for "air-time" - they each request the CD they want. Isaac would want certain discs in particular, while Shawna would insist on those she wants. Since most of both request lists are majority nursery rhymes, I don't understand why they can't both listen and enjoy the same disc. Now how about Asher? Asher loves songs. He doesn't quibble over which disc is being played coz he seems to like them all! How'd we know? Coz he seems to know how to sing all the songs!!! Yeah, he's one amazing boy - he seems to know the lyrics and would sing along to most of the songs. He doesn't belt out full sentences of lyrics of course, but he'd say the words wherever he knows. But seriously, if you hear him, you know he KNOWS the songs. He can however, sing the full alphabet song. Oh, and hubbs has noticed that Asher seems to have a preference for Chinese songs. Yes, hubbs is MOST pleased.